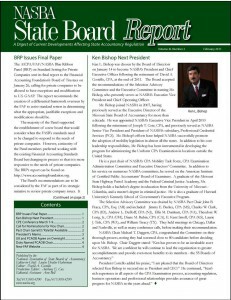 The terms of NASBA’s agreements with the AICPA for extension of the computerbased Uniform CPA Examination contract and the administration of the Uniform CPA Examination outside of the United States were approved at the January Board of Directors meeting subject to final disposition of matters related to the previous agreement. Chair Billy Atkinson and President David A. Costello were authorized to sign the agreements as described to the Board once the legal issues are resolved. The extension of the examination agreement between the AICPA and NASBA will modify and extend the existing terms to January 2024, with the present tri?party agreement, including Prometric, ending in 2014. Senior Vice President Bishop explained that under the extended agreement NASBA would have greater control of the Board of Examiners, including more direct selection of state board BOE members and rotation of the BOE Chair between the AICPA and NASBA every two years. The new agreement will also have improved escrow features. Mr. Bishop said the International Delivery of the CPA Exam Task Force is meeting with the 11 states that handle the majority of non?US CPA candidates to understand their concerns and ascertain their participation in the non?US testing program. The program will cover not only foreign candidates, but also candidates who are foreign?born, educated in the United States and who want to take the Uniform CPA Examination in their home country, which they will be able to do for an additional fee, Mr. Bishop told the Board. He explained the program is being developed so that it will pay for itself and sites for the examination will initially be where Prometric has a test site. Executive Vice President Cote said pilot test sites in Bahrain, Israel, Japan, Lebanon and the United Arab Emirates are being considered. These sites were identified by Prometric as posing the least risk to intellectual property, he explained.